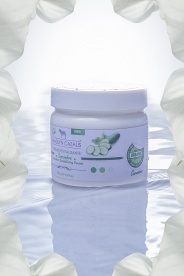 Minimum quantity for "Natural Cucumber Cream - Anti-wrinkles/ concealer" is 1. If your skin is tired or aging , this natural cucumber cream will restore its elasticity, tone and will rejuvenate your skin thanks to the presence of vitamin E and trace elements provided by herbal extracts. Good concealer, it can also be applied to stretch marks to improve circulation. Use: Apply morning and evening.